Welcome To Your Brain: "...a terrific, surprisingly fun guide for the general reader"
"...a terrific, surprisingly fun guide for the general reader"
Our first review - in Publishers Weekly! 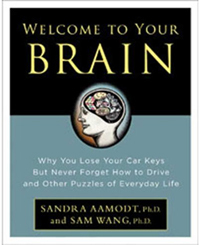 Neuroscientists Aamodt, editor-in-chief of Nature Neuroscience, and Wang, of Princeton University....tackle such potentially controversial topics as whether men and women have different brains...and whether intelligence is shaped more by genes or environment....Distinguishing their book are sidebars that explode myths—no, we do not use only 10% of our brain's potential but nearly all of it—and provide advice on subjects like protecting your brain as you get older. The book could have benefited from a glossary of neurological terms and more illustrations of the brain's structure. Still, this is a terrific, surprisingly fun guide for the general reader. It's an interesting point about the glossary and illustrations. We thought that leaving these out would make for a friendlier book. It's something to think about for the future.